Hold in your hands an HD-SLR able to capture images rivaled only by those produced with a medium-format camera: extremely low noise, incredible dynamic range and the most faithful colors. Meet the Nikon D800E, a 36.3 megapixel FX-format HD-SLR for professional photographers who require end results of the highest quality, who demand superior performance, speed, handling and a fully integrated imaging system. 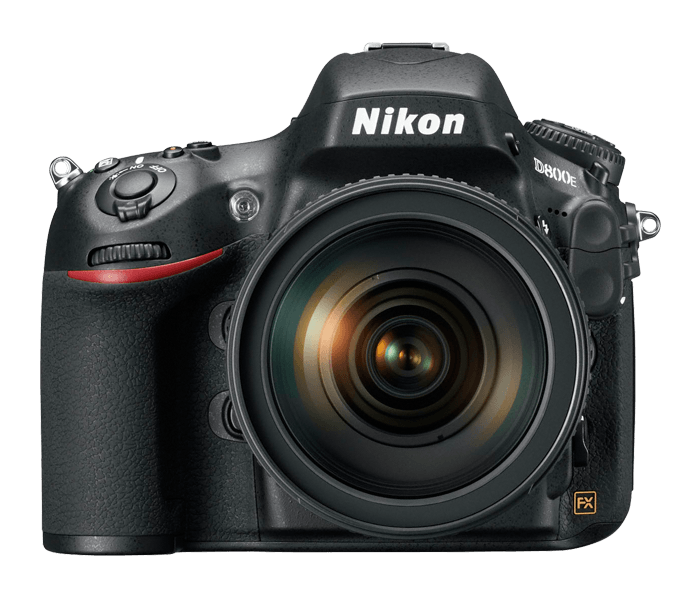 For the studio or nature photographer who looks for the ultimate sharpness, the D800E removes the "effect" of the optical low pass filter (OLPF) providing increased resolution in images. This brings a slight gain in sharpness and resolution, and is recommended for studio and still life professionals but carries an increased possibility that moiré and false color will appear. For cinematographers and multimedia professionals, 36.3MP means true 1080p Full HD cinematic quality video and includes inputs for stereo microphones and headphones, peak audio meter display, DX crop mode to maximize NIKKOR lens selection and angle of view and much more. Wedding, commercial or landscape, the D800E is the ultimate 36.3 MP FX-format camera for creative genius. Witness tonal range and precision rendered to supreme clarity, depth and texture. Make poster sized prints without sacrificing detail. Explore creative opportunities with ISO 100 to 6400 (expanded up to 25,600)—shoot from dawn to dusk. Experience Nikon's new Advanced Scene Recognition System featuring the 91,000-pixel RGB light meter capable of rendering unprecedented levels of accuracy to AF, AE, i-TTL flash control, face recognition and auto white balance. Nikon's new EXPEED 3 image processing reduces color phase shifts seen with lesser systems, producing more faithful colors and tones while managing massive amounts of data at breakthrough speed. With the D800E in your hands, achieve what was once unreachable. Filmmakers, multimedia professionals and event photographers—record Full HD 1080p at 30/25/24p or 720p at 60/50p in AVC format. Produce to your exacting vision when working in manual mode, controlling aperture, ISO, AF and shutter speed. Record uncompressed files via HDMI to an external recording device. via HDMI. Widen production perspective using either Nikon FX or DX lens formats at Full HD 1080p and 16:9 aspect ratio. Attach headphones and check audio levels or monitor input via peak audio meters as displayed on the camera's LCD monitor. Microphone sensitivity can be adjusted in up to 20 steps. Remotely start and stop video. Simultaneous Live View on the camera's LCD monitor and external monitor during recording are possible. Precise AF detection is critical to sharply render every pixel of the D800E's massive resolution count. An improved 51-point AF system with 15 Cross Type AF sensors, versatile AF area modes and superb AF detection in even the dimmest lighting deliver immediate, pinpoint focus. Fast shot-to-shot time, full resolution frame rate up to 4 fps, 6 fps in DX crop mode and ultra fast CF and SD card write times. For more productive workflow, high-speed data transfer using USB 3.0 is realized. For demanding professionals, the D800E responds immediately and precisely. Filmmakers, multimedia professionals and event photographers—record Full HD 1080p at 30/25/24p or 720p at 60/50p in AVC format. Produce to your exacting vision when working in manual mode, controlling aperture, ISO, AF and shutter speed. Record uncompressed files via HDMI to an external recording device. via HDMI. Widen production perspective using either Nikon FX or DX lens formats at Full HD 1080p and 16:9 aspect ratio. Attach headphones and check audio levels or monitor input via peak audio meters as displayed on the camera's LCD monitor. Microphone sensitivity can be adjusted in up to 20 steps. Remotely start and stop video. Simultaneous Live View on the camera's LCD monitor and external monitor during recording are possible. Intuitive design makes D800E operation a thing of beauty. A streamlined ergonomic body allows critical photography and video tasks, including Movie Record, Live View, White Balance and Picture Control to be performed at the touch of a button. Confirm image capture and view menu options, histograms, video settings and more using the D800E's super sharp 3.2-inch 921,000-dot LCD screen with 100% coverage. Anti-glare coating and auto brightness control ease of viewing, no matter the environment. Enlarge images up to 46x for on-the-spot focus confirmation. Magnesium alloy construction and environmental sealing make the D800E as comfortable in the field as in the studio. Nikon's EXPEED 3 technology extends and assures breathtakingly rich image fidelity and reduces noise, even at high ISOs. EXPEED 3 is so powerful that it handles data-intensive tasks such as Full-HD video recording at 30p with ease. The D800E's 3.2-inch super-sharp 921,000 LCD monitor automatically adjusts LCD brightness and visibility according to your environment for bright, crisp image playback, menu adjustment and Live View shooting. Enlarge images up to 46x to make on the spot focus confirmation—crucial for high resolution shooting. The convenient Picture control button provides six preset options: Vivid, Monochrome, Neutral, Standard, Landscape and Portrait for stills and video while 9 customizable settings provide advanced, personalized color control. AF NIKKOR other than type G or D*2: All functions supported except 3D Color Matrix Metering III. AI-P NIKKOR: All functions supported except autofocus and 3D Color Matrix Metering III. Non-CPU: Usable in [A] or [M] mode Center-Weighted or Spot Metering; Electronic Rangefinder can be used if Maximum Aperture is f/5.6 or Faster.